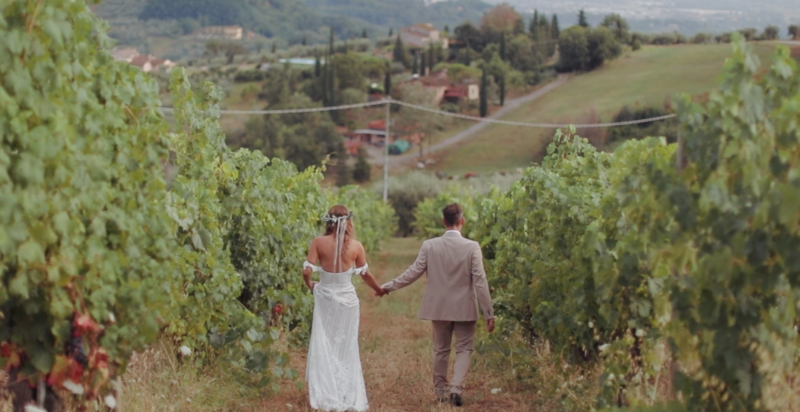 Freedom, liveliness, energy and lots and lots of Tuscan tradition for Andrea and Marica’s wedding! The bride and groom’s request of an unusual wedding was amply satisfied without guving up romance or bon-ton! The open air ceremony was celebrated in a beautiful farm surrounded by the hills and vineyards of Lucca, decorated with wooden crates, pots of hydrangea, peonies, rosebuds, chamomile and lavender, and as a wedding carpet a sweep of pink and white rose petals! Another noteworthy, unique detail was the rustic chic box that held the couple’s wedding rings! Pallets and haystacks served as seating for the buffet dinner, characterized by the variety and abundance of food and the ample choice, the quality and the dramatic aspect :show cooking of panigacci, round bread cooked on the spot on a red-hot grill, rustic corner with cheese, ham and salami, seafood corner, skewered meat barbecue and an area dedicated to typical like pappa al pomodore (tomato and bread soup) and zuppa di farro (spelt wheat soup).